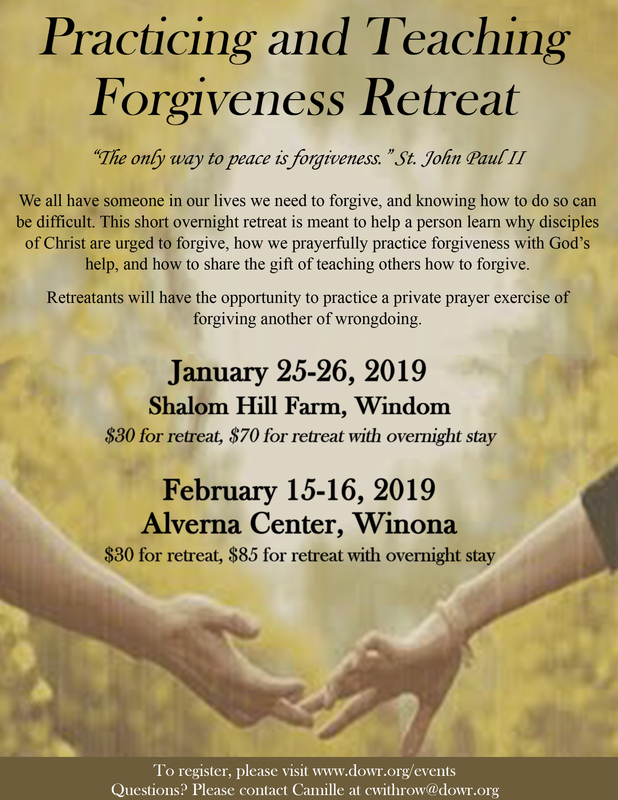 Holy Discontent is a young adult retreat sponsored by FM i.d.9:16 and the Diocese of Fargo, Saturday, January 26th from 9:00 a.m. to 4:00 p.m. at the Diocesan Pastoral Center in Fargo. The Lord wants to awaken us from a comfortable existence into a restlessness that yearns for more--more of His life, His Spirit, and His Heart, which breaks for the lost. This Summit will include talks, time for prayer, reflection, and communal worship. It’s time for the 68th annual St. Joseph's Mardi Gras Celebration at St. Joseph's Catholic Church in Williston. You won’t want to miss the weekend filled with food games and fun! On January 26th beginning a 11:00 grab a slushburger, pie and coffee and join in the auctions bake sale and bingo. On January 27th it’s the Roast Beef Dinner Raffle, Cakewalk and Entertainment. Join us for all this and more at the St. Josephs Mardi Gras in Williston. Join us for the inaugural Crafting Vocations celebrating the vibrant Vocations to the priesthood, religious and married life coming from bisonCatholic at NDSU! Crafting Vocations will be Saturday, January 26 from 6:00pm-9:00pm at Prairie Brother Brewing Company, 4474 23rd Ave South - Fargo, ND. The cost is $40 per ticket or $75 per couple for appetizers and craft brews. A silent auction will also be taking place for one of a kind items and services. Proceeds from this event will benefit the ministry work of bisonCatholic. Please call St. Paul's Newman Center to reserve your ticket, 701-235-0142. Limited tickets sold. The Diocese of Crookston will be hosting a workshop for youth ministers, catechists, clergy, and volunteers who work with young people on Saturday, January 26 from 10:00 a.m. to 4:00 p.m. at St. Mary’s Catholic Church in Fosston, Minnesota! The event will be led by Everett Fritz, author of The Art of Forming Young Disciples. Cost of the workshop is $10.00 per person, payable at the door. Stella Maris Academy in Duluth is kicking off Catholic School's Week with an All Campus Open House Sunday, January 27th from 11:30 a.m. til 1.:00 p.m.
All three campuses will be open to potential families. Visit https://www.stellamaris.academy/open-houses/ to learn about upcoming open houses in February and March. If you're a new family attending one of our open houses, you can enter to win a $1,000 tuition credit! The Bismarck/Mandan Right to Life Chapter invites you to participate in their annual March for Life on the Bismarck Capitol steps on Sunday Jan 27th at 2:00 p.m. Please come out and pray with us to end abortion if you are able. If you can’t be there in person please join in prayer that the sanctity of life will be recognized and cherished. We hope to see you at the march on Sunday January 27th! After the march, you are invited to the reception at the Heritage Center. St. Joseph School in Mandan is holding their annual school Carnival from 11:30 AM to 3:30 PM Sunday, January 27th in the gym. Start the day with a delicious breakfast in the school cafeteria from 9:00 AM to 12:00 PM. Then enjoy the carnival with BINGO, many other fun games, a photo booth, a balloon artist, great concessions, the wine grab, a gun raffle and even a $500 drawing. You’ll have a chance to bid on numerous items on the silent auction too. Trinity Elementary in West Fargo invites you to their family fun fair on Sunday January 27th from 12:00 p.m. till 3:00 p.m. Pizza will be served from Noon till two. And GAMES GALORE will be there with their bouncy houses. There’ll be a silent auction, bake sale, bingo, magic shows, student art and baskets, face painting, a prize walk and carnival games! It’s their biggest fundraiser of the year. Join them for the Family Fun Fair at Trinity Elementary in West Fargo! Please join us for the annual Catholic Schools’ Week Breakfast Buffet sponsored by the Monsignor O’Shea Council of the Knights of Columbus. The breakfast, held on Sunday, January 27th at the Holy Rosary campus of Stella Maris Academy in Duluth, celebrates the beginning of Catholic Schools week. Doors open at 8:00 a.m. and breakfast is available through 12:00 p.m.. Breakfast includes pancakes, eggs, sausages, breakfast potatoes, muffins, cinnamon rolls, juice, and coffee. Tickets are $8.00 for adults, $5.00 for children, and $25.00 for families. Join us for a great breakfast for a great cause.! This year, as we celebrate Catholic Schools Week, you will want to miss the inspirational seminar Love Unleashes Life, the Art of Communicating Truth. This event is Monday, January 28th at 7:00 pm in the St. Mary’s Central High School Gym. The seminar is presented by international speaker and author Stephanie Gray. Stephanie inspires audiences of all ages through her passionate story-telling. Admission is free and day care is available so come see Love Unleashes Life! Join hosts Andy Shaw and Fr. 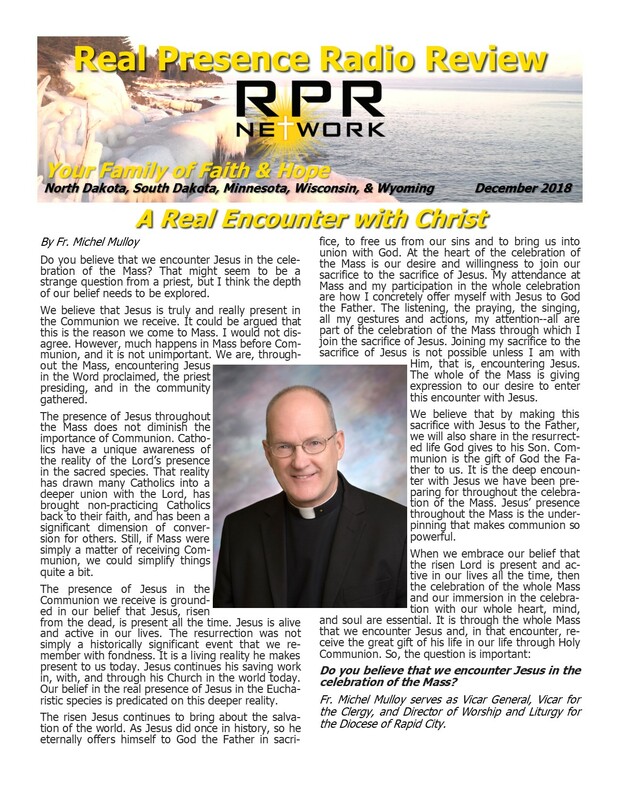 Michel Mulloy on Monday, January 28 as the priests of the Rapid City Diocese take on students from St. Thomas More Catholic High School in the ultimate battle on the hardwood. LIVE coverage on the RPR Network begins at 6:45 p.m. MT, with the tip-off at 7. If you can, join us in person at the St. Thomas More High School gym. Listen on the radio at FM 89.9/94.7, online, and on our app. We will also be streaming via Facebook Live. The Moorhead Knights of Columbus invite you to our 40th annual “Clergy Appreciation Night” on Tuesday, January 29th, at the Hjemkomst Center in Moorhead; a wonderful evening celebrating the clergy of our area. Social hour at 6 pm, dinner at 7, and featuring guest speaker Msgr James Shea from the University of Mary. Reserved tickets and table sponsorships are available by calling 218-790-5399, or at St. Joseph’s and St. Francis de Sales Churches in Moorhead. Join us for Clergy Night, January 29th! The Music Parents Association of St. Mary's Central High School in Bismarck invites you to their "Loaded Potato n' Toppings with Root beer Floats" event, Tuesday, January 29th from 4:30 p.m. til 7:00 p.m. Join us in the SMCHS cafeteria where loaded potatoes will be served up for $5.00 and rootbeer floats for $2.00. Proceeds from this event will support the SMCHS Music Department. Come and get your fill of some delicious potatoes and a refreshing root beer float at St. Mary's High School! January 29: "Grill the Priest" with Fr. Tim Biren Social hour starting at 6:00 p.m., with the talk beginning promptly at 7:00 p.m. (please have drinks/food ordered prior to 7:00 p.m., if possible). Following the speaker, there will be a brief break, then a Q & A session, concluding at 8:30 p.m. Grab your staff, lace up your sandals, and get ready to ship off to Bible Boot Camp for the 10th annual Know Your Faith Competition! Join hosts Fr. Kregg Hochhalter and Fr. Justin Waltz on Wednesday, January 30, as five Catholic schools from across North Dakota and Minnesota battle it out to see who knows their faith best! LIVE coverage from Shanley High School in Fargo begins at 11 a.m. CT on the radio, online, and on our app. We'll also be streaming via Facebook Live! Catholic Schools week kicks off for St. John Paul II Catholic School in Gillette on January 27th with planned activities throughout the week! They invite you to their open house on January 31st from 5:00 to 7:00 pm. You can go to the NCEA website and donate to JPII Catholic School starting on the 29th and running for 24 hours. Anyone can donate to our school on the personalized page. For more information call 307-686-4114. The Mandan Knights of Columbus Councils of St Joseph, Spirit of Life and Christ the King will be hosting a Knights Basketball tournament on Friday February 1st at the Christ the King gymnasium. Doors open at 5:30 p.m., tip off is at 6:30 p.m. for the first of three twenty minute games featuring each of these councils taking on one another. Admission is free, concessions available. Bring your friends and family and get ready to cheer for your favorite team! For Barbara who just had hip surgery, that she may experience a safe and quick recovery. For Fr. Katanga and the Diocese of Fargo, that the Lord will guide the actions and decisions of all those involved.